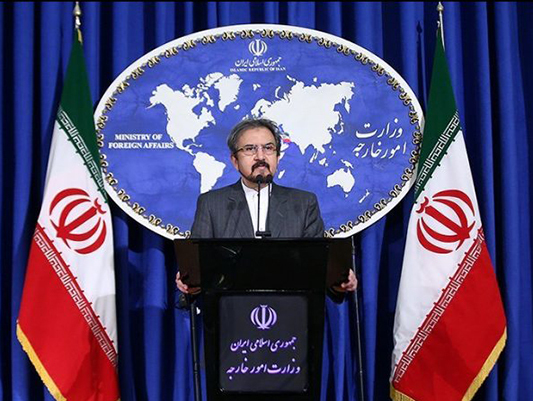 Iran’s Foreign Ministry Spokesman Bahram Qassemi has rejected the anti-Iran claims made by the foreign minister of the United Arab Emirates and Bahrain at the UN General Assembly, saying that such remarks are baseless, worthless, and illusory. In a statement on Sunday night, Qassemi reffered to the worn-out claims made by the Emirati and Bahraini foreign ministers, saying the Islamic Republic of Iran has always followed the policy of showing respect for its neigbours. He said that mutual respect and good neighbourliness are among the main priorities of Iran’s foreign policy, and meddling in the internal affairs of other countries has never been pursued by the Islamic Republic. “The alignment of the foreign ministers of Bahrain, the UAE and Saudi Arabia with the Zionist regime’s anti-Iran and warmongering policies and attitudes only legitimises the Israelis’ crimes and the regime’s creation of rifts,” Qassemi noted, adding that Abu Dhabi and Manama are destroying their own legitimacy. He further noted that the wrong approach will make it more difficult for Muslim countries in the region to build mutual trust among themselves. The foreign ministry spokesman finally advised the UAE and Bahraini authorities to stop blindly following dictated policies that are against the interests of the regional countries and the Muslim world. “Instead of making baseless allegations against the Islamic Republic of Iran on a daily basis, they had better think about Iran’s initiatives and ideas to provide security, stability and regional cooperation and reduce tensions and misunderstandings in the region,” he concluded. The UAE Minister of Foreign Affairs on Friday claimed that Iran supplies arms to rebels in Yemen and tries to undermine the UN mediation. Sheikh Abdullah bin Zayed told the UN General Assembly that an “increasingly dangerous” situation had developed through the unprecedented level of Iranian “aggression” in the region. A day later, Bahraini Foreign Minister Sheikh Khalid bin Ahmed bin Mohammed Al Khalifa also alleged at the UNGA that “Iran is threatening security in the straits of Hormuz and Bab el-Mandeb,” adding that Iran supports Yemen’s Houthis in threatening neighbouring countries. He further alleged that Iran is adopting a policy of sabotage and supporting terrorism in the region and that achieving lasting security requires a strategic alliance between the countries of the region.